Get an obligation free quote for a residential or business solar panel installation and START SAVING TODAY! QUOTE ME ON GOING GREEN! Not sure where to start? We break it down for you here. 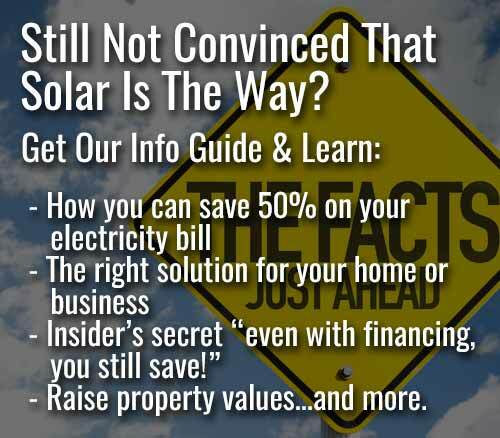 We have a solar solution for everyone. Find yours here. Curious to see how much you will save by going solar? Go here. We can also help you with financing! Go solar, and start saving today here! There’s a good reason why our ancestors worshipped the sun. The sun gives life – without it, life on Earth wouldn’t exist. Our beautiful diverse planet would be a lifeless rock. Solar energy, or solar power, is free energy that comes from the sun. With modern technology, we can capture this energy, convert it into thermal or electrical energy for use in our homes or businesses, and store it for further use when needed – even when it’s overcast, or after the sun sets. Solar power is the energy solution of the future. Not only does it lower household costs and help the environment, it also creates job opportunities and a better lifestyle for everyone. We can harness this energy for a variety of everyday uses that will save you money and help prevent pollution. Solar energy is used to generate electricity for household appliances, provide light, maintain a comfortable indoor environment, and heat water. So why use SolarConnect for your solar energy solutions? Solar energy is the most abundant and cleanest renewable energy source available on Earth - and South Africa has some of the richest solar resources worldwide. We offer dual energy electricity systems, and financing options make it super easy to switch to solar. We have many technologies, products and solutions for our clients all over South Africa. Simply, we provide South Africans with solar solutions tailored to suit them and their environment – and help to make the world a better place. WHY DO I NEED SOLAR ENERGY? Solar power is a clean, green source of energy that pollutes less than almost every other source of energy. Solar power doesn’t produce greenhouse gases. It doesn’t pollute water or any other part of nature. Yet, so many people continue to question: why go solar? Our answer is simply: why WOULDN’T you want to go solar? Another vital consideration for South Africans is that we live at the mercy of the power companies. With solar power, you can avoid the stress of price fluctuations and blackouts, and get cheap energy all day. SolarConnect helps protect the power grid - the more people who generate energy with solar power, the less likely we ALL are to experience blackouts. Each house with solar cells on it, functions as a small power plant, which provides us with a great grid security in case of human-caused or natural disasters. No government body or corporation owns the sun. Solar technology is the future for everyone! South Africans are familiar with ugly coal mines and electricity plants in our beautiful country. South Africa has lots of land, away from big cities, which isn’t being used for anything. With solar power, we can make use of this land without harming the environment for people and animals in the way that fossil fuel does. When you use coal, oil, or natural gases to generate your electricity, you often make use of energy from another part of the world. You are paying other countries for electricity – money that could be going back into our own economy for our own people. Solar energy is rising. The future is here. Don’t be left behind in the past! HOW MUCH WILL I SAVE BY GOING SOLAR? Use the table below to see your savings over a 10-year period while on one of our financed solar packages. This is based on a current monthly bill of R1000. To work out your savings based on your current monthly electricity bill, take a look at our solar savings calculator. Read more about our pricing and packages. Not sure which solar system is right for you? Our Solar Savings Calculator which will show you exactly how much you can save, based on your current electricity bill (up to 50%! ).